Like anything in life, Drama lives where Drama is created. FB is another platform for people to gain a certain heir of strength they wouldn't otherwise have outside the veil of the Internet. Roll with the entertainment. If not FB, it would be another site, right? OK! Who says online life is boring? Peeps online are scary,.. they certainly scare the ish out of me. I agree with Christine, they are not only do it on FB, I have witnessed many online wars. None of them pretty. Ah, without Facebook, blogs and Twitter all of the idiots wouldn't have a public voice. I'm so tired of seeing people's political statuses and commentary on facebook. Most of the time people just end up looking completely misinformed. And I doubt any of these folks picked up the phone or wrote an email/letter to their representatives about the health care issue. Not that it would do anything, but at least it's being proactive. Then again, it's much easier to garner attention on Facebook. People are idiots on FB. My Mother included. That's why I had to hide her. Don't you love people watching. I'm kind of over FB, however it seems to be the only way I can get in touch with one of my bestest friends who lives across the world from me. So, I check it every once in a while, and often find funny litte catfights...however, nothing like what you've highlighted here! It's too bad these ladies couldn't agree to disagree. and that's the reason why I don't talk or post about politics. People are always trying to push THEIR opinion on you. It seems like 95% of people don't know what it is to "respect another person's opinion and leave it at that." I finally joined FB about a month ago. I messed around on there for a few weeks and haven't been back since. The nostalga came and went pretty damn fast. It always amazes me that people think online fights are worth it or appropriate. 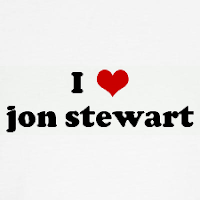 I heart Jon Stewart too and I am annoyed that they are off this week. I cannot wait to hear what he has to say about the bill! Yankee Girl - I KNOW! WTF Jon!? What a week to pick for Spring Break. It never ceases to amaze me the things people say on Facebook. Hiding behind a computer makes people a lot "braver," but a lot dumber too! Thanks for stopping by my blog! Glad you found me, and as a result, I found your blog. I have incredibly large amounts of respect for single moms...I was raised by one for years before my stepdad came into the picture. I love mac 'n cheese. Don't even think about dissing it.